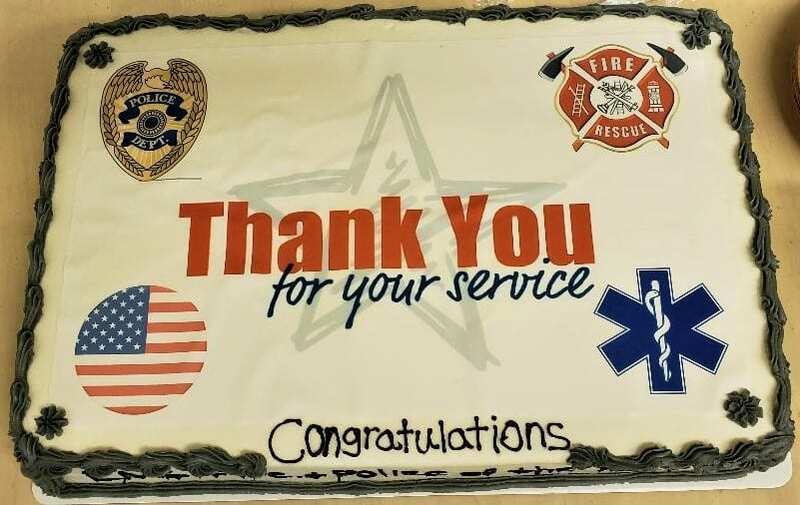 The VFW had a beautiful cake made for the award ceremony. Annually, the local Craig VFW Post #4491 awards individuals working in the emergency services a beautifully framed appreciation certificate and a gift card. They include: the Police Officer of the Year, Firefighter of the Year and Medical Provider of the Year. Approximately 25 VFW members were present this year to honor the individuals who were elected. Each recipient was congratulated and thanked multiple times for their service. Other citizens attended to show their appreciation too. Post Commander Billy Lee read aloud each person’s letter of recommendation that was submitted to the VFW. Boisterous handclaps and a few hoots and hollers occurred as this was happening. Adjutant Bill Burleson then presented each person with a gift card to Lowe’s worth $50. Robert DeCarolis was the first to be acknowledged.